High quality stainless steel sausage stuffer offers durability and dependablity at an economical price. Ideal for home or commercial use. 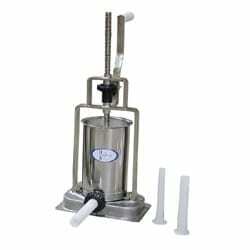 Omcan’s vertical sausage stuffer offers durability in an easy-to-clean stainless steel finish. Comes complete with three spouts and a 6 pound meat capacity.